Dust off your platform shoes, and pull out the polyester! We are taking over the ever popular Disco fundraiser! This event has been a blast every year and we are excited to be able to continue the tradition. 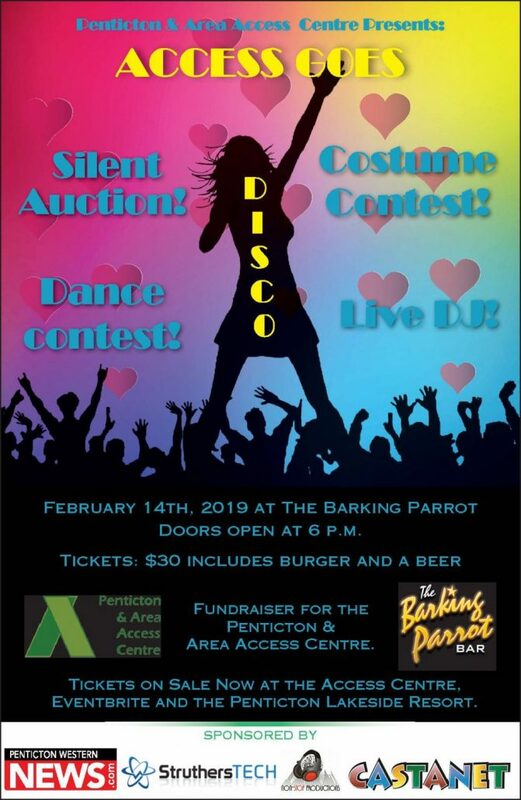 This year there will be a live DJ, silent auction,dance and costume contests, a disco lesson as well as 2 disco performances by Army of Sass and a surprise guest. We will of course have disco music and dancing until the wee hours with DJ Shakes. Tickets are $30 and include a burger (veggie or meat) and beer. We also have plenty of door prizes, a 50/50 and other surprises so you don’t want to miss out. All proceeds go towards the new Men’s Counselling Program at The Penticton & Area Access Centre. Come and support a great cause and have an amazing evening! Tickets are $30 and include a burger and a beer. Disco lessons, live performances, dance/costume contest and a silent auction.